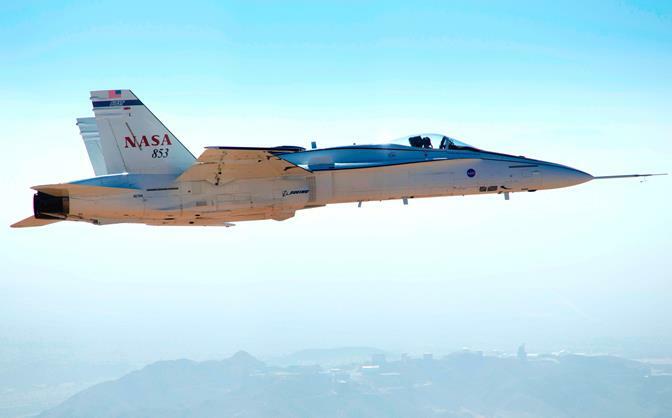 EDWARDS – NASA has completed the first tests with an F/A-18 research jet to evaluate the autonomous flight control system for the agency’s Space Launch System (SLS) rocket. The system, called the Adaptive Augmenting Controller, will allow SLS to respond to vehicle and environmental variations such as winds or vehicle flexibility after it blasts off the launch pad and heads toward space. This is the first time a flight control system for a NASA rocket is being designed to adjust autonomously to unexpected conditions during actual flight rather than pre-flight predictions. This ability to make real-time adjustments to the autopilot provides enhanced performance and increased safety for the crew. The tests were flown Nov. 14-15 out of NASA’s Dryden Flight Research Center at Edwards Air Force Base. During the flights, more than 40 tests were conducted using SLS-like trajectories. The system was evaluated in different scenarios for up to 70 seconds at a time to match the rocket’s dynamics for the majority of its flight from liftoff to solid rocket booster separation. During the flight, NASA simulated both normal and abnormal flight conditions, such as sloshing propellant, and identified key aircraft vibrational characteristics. The flight test data will be used to refine software for SLS and plans for future F/A-18 flights, which will run through the end of the year. This flight control system will be ready for the first flight test of the SLS, scheduled for 2017. That flight will feature a 70-metric-ton (77-ton) lift capacity configuration and carry an uncrewed Orion spacecraft beyond low-Earth orbit to test the performance of the integrated system. As the SLS evolves, it will provide an unprecedented lift capability of 130-metric-tons (143 tons) to enable missions even farther into our solar system to places such as an asteroid and Mars.